Not to be Confused with ‘Hard Rain’. Gas up the Sea-Doo, because Deep Rising is the Greatest Movie EVER? Click on the DVD cover or the title above to download our review of the film, featuring guest host Matt “Saint Mort” Kelly of the Horror Movie Night podcast. Review in a Nutshell: A typical Stephen Summers action-horror movie with some questionable screenwriting and some dodgy CG, Deep Rising is none-the-less remembered fondly by many fans. I am not one of those fans. It’s that time again, time to have some Anime Fun. This time Clarissa from Anime World Order joins us again to discuss the strange, supernatural, and visually unique 2007 TV anime, Mononoke. 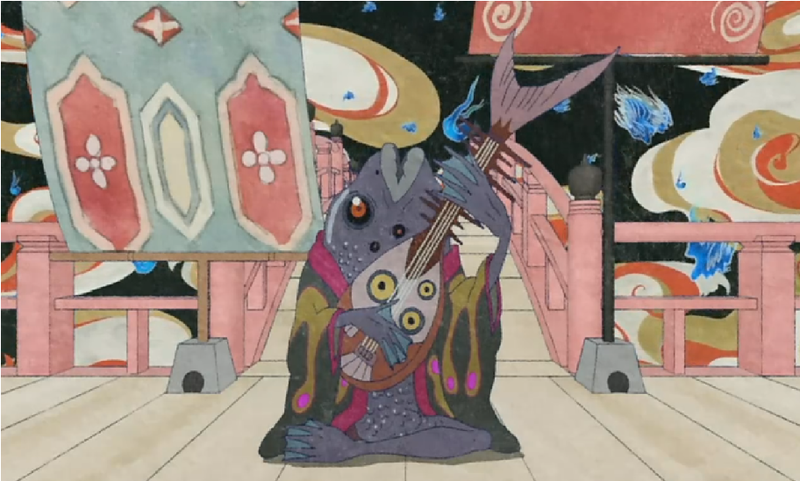 An original series based on the character of the Medicine Vendor from the earlier Ayakashi: Samurai Horror Tales, Mononoke features bright colors but dark subject matter, and it turns limited animation into an artistic statement rather than a budgetary consideration. CLICK HERE or on the image above to download our review of the show. Fish Norio Wakamoto is best Norio Wakamoto. Broadswords and frying pans make great anti-werewolf weapons, and Dog Soldiers is the Greatest Movie EVER! Click on the DVD cover or the title above to download our review of the film, featuring Sean ‘Hollywood’ Hunting. Review in a Nutshell: Gruesome and gory, Dog Soldiers is a fun little action-horror film with a grotesque sense of humor and great onscreen chemistry among the soldiers. The werewolf suits are pretty cool, too. Sharpen your butcher knives, because Silent Hill: Revelation 3D is the Greatest Movie EVER! Review in a Nutshell: A misguided attempt to bring the plot of the films in line with the narrative of the video games, Silent Hill: Revelation 3D tries for grotesque horror and fails spectacularly with hilarious results. Few films have made me laugh this hard while attempting to scare or unsettle me. Guest Spot on The Info Zombie Podcast! Hey, everyone. Carl Boehm of The Info Zombie invited me to talk about John Carpenter’s Halloween and the challenges of horror literature. CLICK HERE or on the graphic above to check it out. Fire up your motorcycle, because Ghost Rider: Spirit of Vengeance is the Greatest Movie EVER! Click on the movie poster or the title above to download our review of the film, featuring Daryl Surat of AnimeWorldOrder and Rachel Pandich, author of Aspire. Review in a Nutshell: This movie is enjoyably terrible, and the review strays into some surprisingly intellectual territory. We are all shameless Nicolas Cage apologists. Do not believe our lies.